In November of 1957 while visiting Las Vegas, NV Elvis met and was photographed with Hannerl Melcher, Miss Austria of 1957. 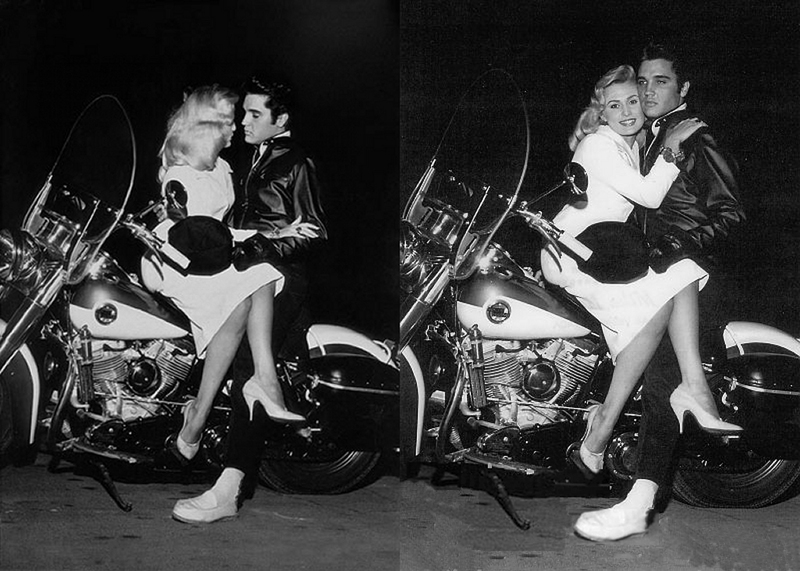 Among the shots in the session were several posed on a new 1958 Harley-Davidson FLH Duo-Glide. Though this particular bike was not his, and only pictured in those sessions, the model was his next bike after his 1957 Hydra-Glide. It too was likely purchased at the Memphis Harley-Davidson Co. He has been pictured with it at least as early as the summer of 1958, no doubt acquiring it sometime before that. B. W. Barfield's Harley Davidson Co. was located at 235 Poplar Ave. in Memphis until sometime by the mid sixties when Barfield was bought out by (Tommy?) Taylor who moved the Harley Dealership to 2549 S. Bellevue Blvd. Ron Elliott of Super Cycle remembers Taylor only as Old Man Taylor and how he was very difficult to deal with. 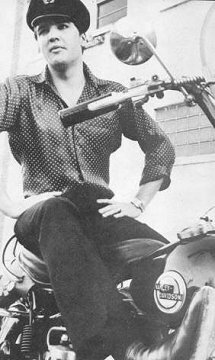 Taylor would refuse service to anyone who made mods to their bikes, like putting on a sissy bar and Ron said he never knew anyone that liked him. He said he did learn a lot from him though, especially regarding the practice of stocking the variety of parts. Ron later restored Jerry Lee's 1959 Duo-Glide, remembering that Jerry wanted a white seat. Ron had one and still has the original black one. 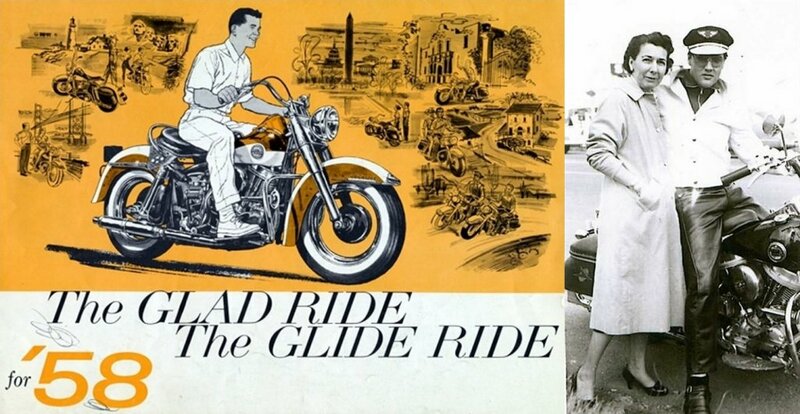 The 1958 Duo-Glide when it was introduced by Harley-Davidson was the next major change for the FLH. 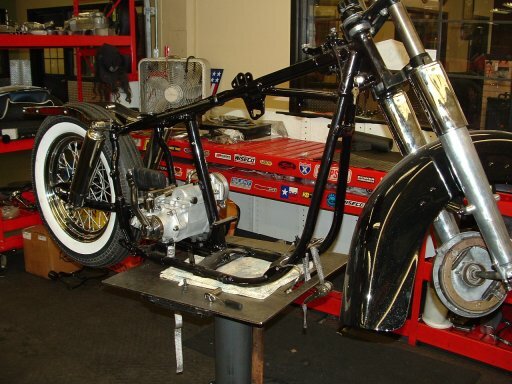 While the earlier bikes featured a single rigid tubular frame the Duo-Glide had a swing arm rear suspension supported by shock absorbers that further cushioned the ride. 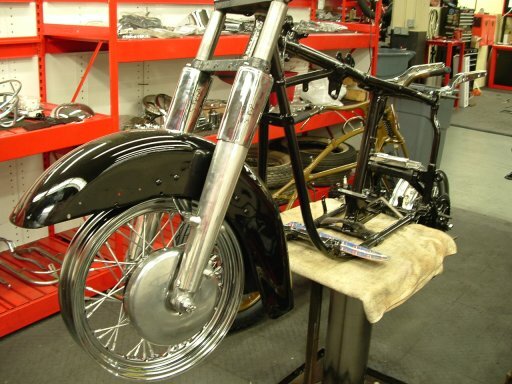 While the Hydra-Glide was defined by the hydraulic telescopic front forks, the Duo-Glide derived its name from the cushioning added to the rear. These models were also powered by a 74ci Panhead and commonly featured a new two-tone paint scheme. Elvis’ though was solid black like his 1957 and though full dressed with the “King of the Highway” option, they no longer came with front and rear "cheese grater" bumpers. Pictures of his are easily distinguished from those of his '57 FLH by the slightly changed tank emblem, the visible rear shocks and the distinctive “Duo-Glide” name on the front fender. 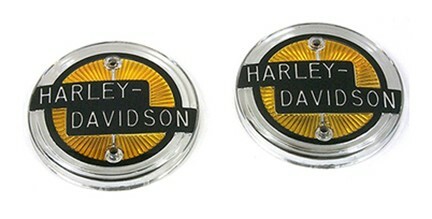 This was also the year that they changed the bubble bags slightly by replacing the two speeding comet and stud emblems with that of what is referred to as the “Delta reflector.” This emblem, when visible, also serves to distinguish the two bikes in photos. 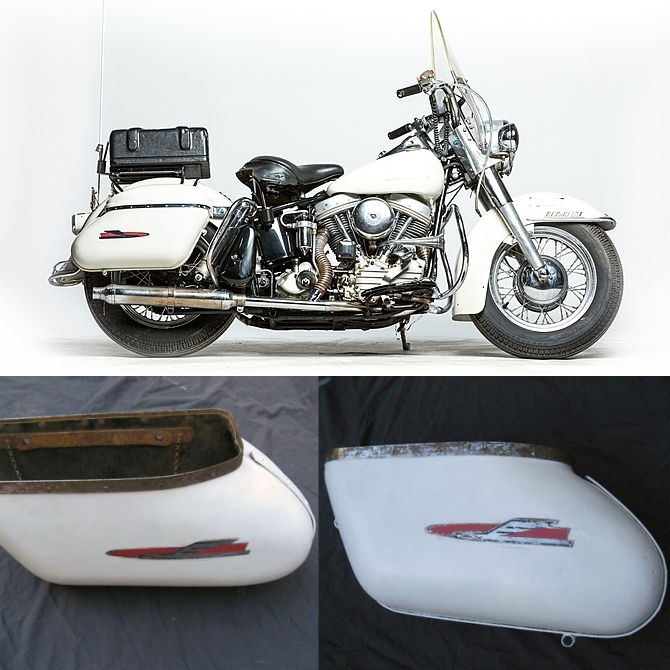 Harley used this style bag at least through 1964 models before switching to the more streamlined. 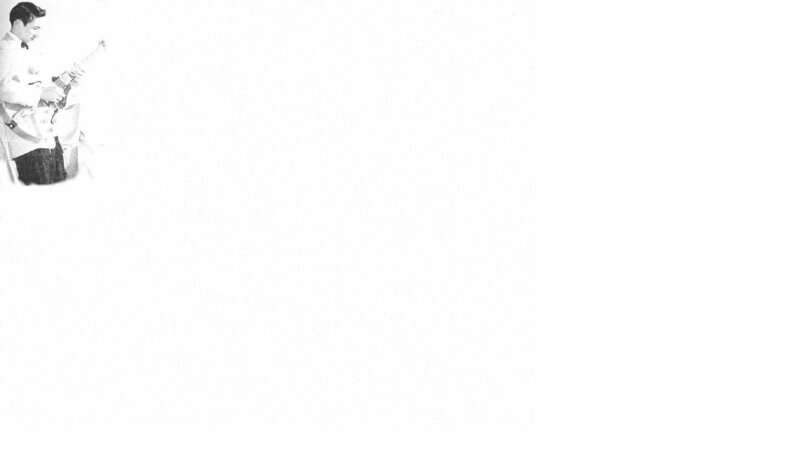 The emblem however would change at least one more time for the last year(s). 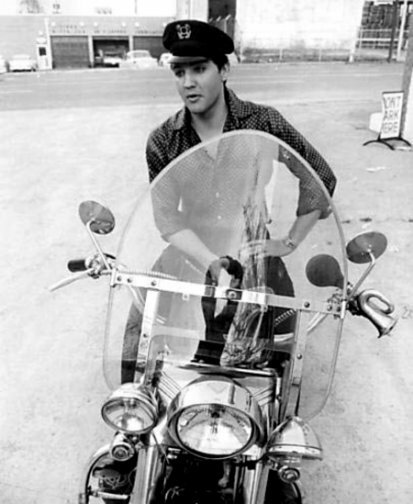 He would have this particular bike at least through the early 1960s when he bought the next evolution of the FLH, the Electra-Glides. 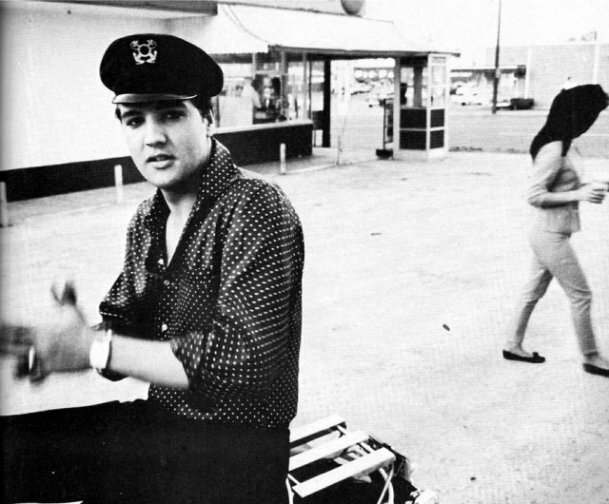 Some of the more common photos of him taken with the '58 were taken by Robert William of the Commercial Appeal in 1963, reputedly at Chennaults (Drive-In) Restaurant in Memphis. 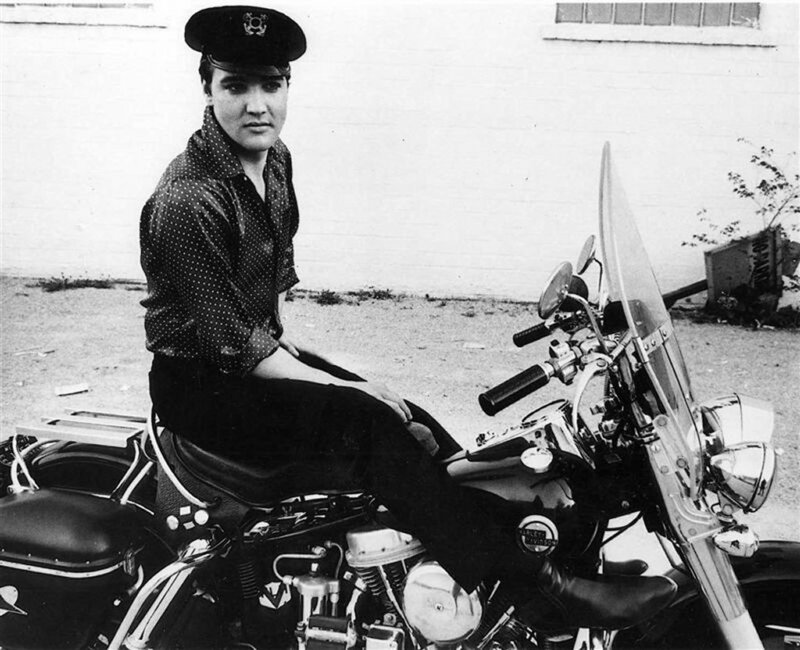 According to Mike Freeman, Elvis had just returned from Hollywood where filming had wrapped on his 13th movie "Fun in Acapulco,” Wearing a yachting cap and riding a motorcycle, Elvis talked with a reporter and photographer on April 2, 1963. Before posing for pictures, he dispatched his motorcycle partner for milkshakes. 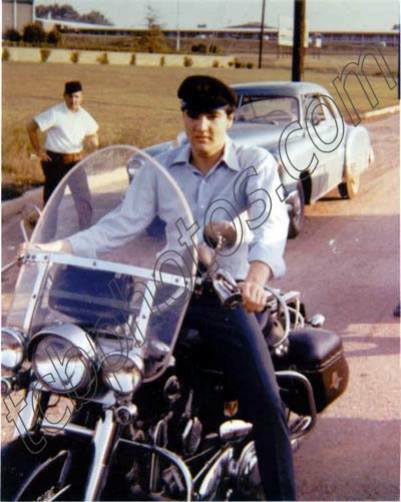 She was Priscilla Beaulieu, 18, whom he met when he was in the Army in Germany.1 Elvis had apparently added a bicycle air horn to the handlebars. 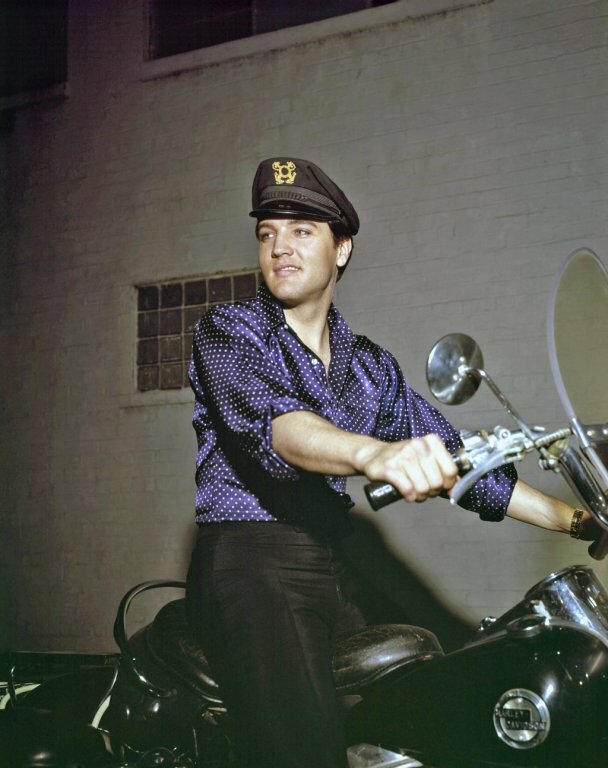 A yachting cap became very popular with him around this time and seems to have replaced the Harley-Davidson caps he wore for riding in the 1950s. 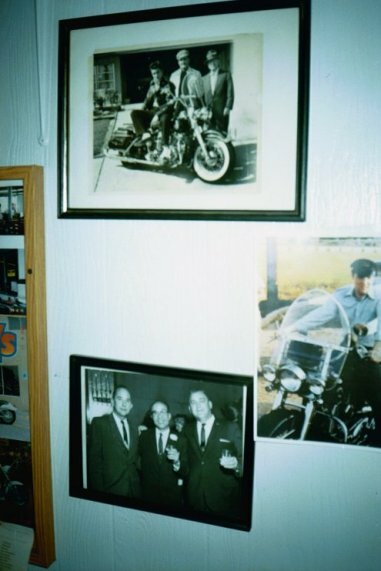 In fact “Big Al” McAlexandar, the former service manager at Memphis Harley-Davidson in the fifties, kept a pictures of him, among others, wearing it while riding the Duo-Glide. With the help of B. W. Barfield, in 1958 Al opened his own place in Memphis which claimed to be the oldest Honda dealership in the Mid-South. Al's Cycle, on Summer Ave. where the pictures hung, was in business for over 40 years. At 1400 South Bellevue, Chennaults Restaurant was a popular spot in White Haven until the 1980s at least. The building is still standing and currently houses other businesses. 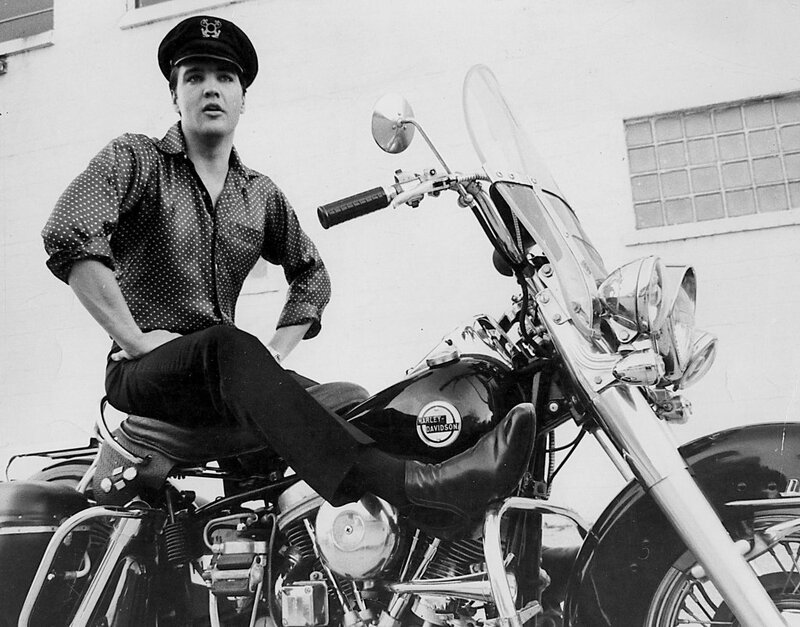 Ten years later, Elvis would be photographed on a Harley again, not far from Chennaults. Special Thanks to Ron Elliott of Super Cycle in Memphis for his assistance with this page.